Kids are going to play football. can it be safe? 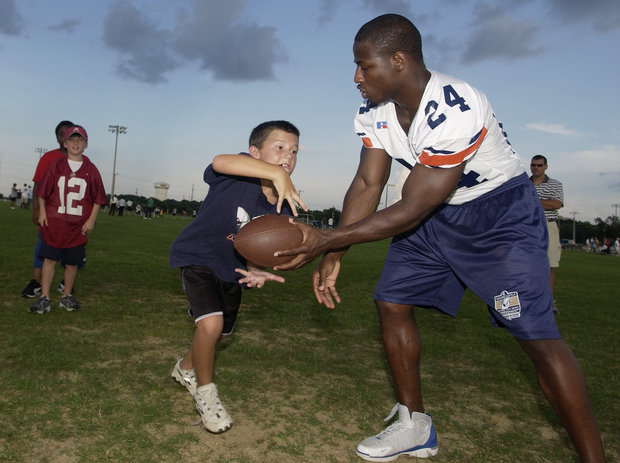 Giving our youngest football players a chance to play the sport they love the right way — safely — is the aim of one former pro and suburban mayor. Palatine Mayor Jim Schwantz, a former NFL linebacker who racked up time with the Bears, 49ers and Cowboys, plans to launch the Northwest Flag Football League for young suburban athletes starting in August 2013. Schwantz said he saw a gap for players at a vulnerable age, third through sixth grades, with only tackle football available in his area. Not that Schwantz doesn’t believe in tackle football — he has coached it for two years. However, he sees risks that could be avoided. According to Schwantz, most players in this age group are not ready for the physical demands of the game. "Studies show kids don’t have the muscle strength in [their] necks to support helmets until they get older and stronger," he said. When it comes to football, the biggest worry for most parents is the potential for concussions. "Any time there is a collision with your head there is a potential to have damage," said Schwantz. “You can fall and hit your head with flag football, but we will do our best to eliminate those instances from happening." Schwantz will do his best to minimize the potential for concussions in his league, which will be managed with scripted plays, using various stations to train and develop the players as athletes. Schwantz and other high level coaches will closely monitor every aspect of the two-a-week sessions. Although kids in Schwantz&apos;s league will scrimmage, they won&apos;t play games against outside opponents; this gives them time to stress fundamentals. “You can work on game plans, you can work on routes, work on plays and defense," said Schwantz. "The emphasis is on the individual training to make sure they are ready to go." The mayor hopes players that want to compete in high school will use this as a stepping stone into tackle football. His league aims to give young players the option to grow and mature without "falling through the cracks." The mayor&apos;s concern is also personal: Schwantz&apos;s son is in eighth grade and plans to follow his dad’s footsteps to play football at Fremd High School in Palatine. When I asked the former linebacker if he worries about concussions with his son, he said yes — there is a concern. If his son were to suffer a concussion, Schwantz said both he and his wife would monitor the situation closely before they allow a return to the field, noting that any subsequent concussions would be risky if they didn’t manage the initial one. Schwantz is not alone in his concern: His son, he said, is also watched by “my wife, my brother, my parents, my in-laws." "We had a bunch of eyes on one kid,” Schwantz said. The league will practice at Harper College&apos;s facilities in Palatine, but space like this is hard to come by. Local fields are filled with soccer, lacrosse and other sports, so unfortunately, any future expansion of a league like this could be problematic.